A little over a year ago I bought an iPad as an experiment. We were planning to fly to Hong Kong and my main purpose for buying the iPad was to see if it’d work as an entertainment device for Calvin. Beyond that, I had no thoughts of what I would use it for. Since I wasn’t sure what my use case was, I didn’t want to spend a great deal of money on it. So, I bought a 16GB, Wifi-only, refurbished iPad2. That device was the best thing ever invented for keeping a child happy on an airplane. Just recently I saw an article whose author seemed to think the end of western civilization was nigh and it was the fault of lazy parents who didn’t want to entertain their kids the old-fashioned way on airplanes. I read this article in stunned disbelief. I do not view myself as an overly strict parent but we do have limits on screen time, types of snacks, etc. However, the moment we get on the plane I have one goal: survive the plane ride with Calvin and me both sane and, preferably, happy. If that means letting Calvin watch 10 hrs of video and eat the occasional piece of candy, I can live with that. When traveling to Hong Kong we were traveling for 23 hrs straight. Of that time, Calvin was grumpy for about 5 minutes. That, my friend, is priceless. Calvin is the main user of the iPad but I do use it for a couple of things. My biggest use is trying to learn Chinese characters via the TrainChinese app. Calvin uses the iPad to watch movies, play games, and also play some educational apps. I’ve also created some “movies” of some of Calvin’s favorite books. I scanned the pictures in the book and then synced the audio book to the pictures. Calvin seems to like these quite a bit and will listen to the audio book while working with legos and occasionally glancing at the pictures. I’m fairly happy with the iPad but I do have two complaints. First, 16 GB is no longer big enough. I’m ripping more and more of Calvin’s movies for the iPad and it’s starting to fill up. This is a fairly minor complaint and it was self-inflicted. My biggest complaint with the iPad is it doesn’t have a lot of good parental controls. I understand iOS 7 has better parental controls than the prior version but it’s still not at the level I want. I want to be able to have different profiles such as the “airplane” profile which lets him use pretty much everything installed and then a “normal day” profile which doesn’t let him watch movies and use the “game” apps without a parental override while still allowing access to the “educational” apps. Because of the two complaints above, I started considering whether or not it made sense to get Calvin his own tablet while letting me keep the iPad (16 GB is plenty for what I use it for). I waffled for quite a bit and finally decided I couldn’t really justify the money. So, I resigned myself to the inferior parental controls and started looking for solutions to the space issue. I investigated a couple of options, including a couple variations of wifi drives. One of the biggest problems I saw with dragging a separate drive along is power. I’m not so concerned about storage space for the iPad on domestic flights. I’m worried about international flights. The iPad has a great battery life and most of the wifi drives I looked out would die significantly before the iPad. Of course, I could bring even more batteries with me to keep the hard drives charged but it seemed like it could get clunky fast. While looking for storage options, I stumbled across several posts detailing how to use the iPad Camera Connection Kit to provide extra video storage. It sounded very kludgy but also like it’d probably do what I needed. The camera connection kit/SD card wouldn’t require any extra power and it is also pretty small. This would also allow me to swap out movies during longer vacations (my iTunes is on my non-portable kitchen computer). I ordered the kit and a 16 GB SD card and hoped for the best. The camera connection kit was scheduled to arrive today. I prepared supper early so as soon as the package arrived I could start fiddling and wouldn’t have to be distracted by minor things like food 🙂 The package arrived and I eagerly opened up and inserted the SD card into the camera connection kit. Then, I went to find the iPad. It was sitting, ever so innocently, on the kitchen table. Calvin had been using it earlier but was now occupied playing Legos with Jaeger. Before plugging the adapter into my iPad, I turned my iPad on. That is, I tried to turn my iPad on. When I hit the power button on my iPad, a curtain of dark gray advanced about 1/3 of the way across the screen and then retreated. The rest of the screen stayed blank. I tried again, same thing. I though that perhaps Calvin had run down the battery so I plugged it in to my computer and saw that it still claimed to be at 50%. I asked Calvin if he had dropped the iPad recently. He looked a little sheepish and noted it had only been dropped a little bit from the couch, accidentally of course. Now, I know for a fact that this poor iPad has been dropped a fair amount by Calvin. Often at distances higher than the couch. However, I had a bad feeling that this had been one drop too many. Just to be thorough, I tried a reset and then a restart. Other than the background briefly changing to a lighter gray, nothing happened. I was able to hook the iPad up to iTunes and it appeared to transfer data fine so it just seemed to be some sort of display issue. At this point, I was pretty convinced it was broken but decided to have iTunes attempt an update and restore just to see. No luck. Jaeger suggested I should make an appointment with the Genius bar. I was a bit dubious because I was pretty sure they would just tell me it was broken. If I was lucky, I thought they might have a way to diagnose exactly what was wrong and then give me the option of having it shipped off to be fixed for some indeterminate amount of money. The problem with this is Calvin and I are flying out on Tuesday. Yes, I’m spoiled but I did not want to fly alone with Calvin without some sort of entertainment device for him. I made the appointment with the Genius bar for a little after supper and then set to researching my tablet options. One of the first things I looked at was how much it’d cost to get another refurbished iPad. The cost was about what I expected. However, the major sticking point was there didn’t appear to be any way for me to get one of these iPads by Tuesday. If I was going to buy a new iPad, I want the 32 GB model. Those looked like they’d cost around $600. Given recent events I was very reluctant to hand over a $600 tablet to Calvin. I turned my attention to Kindle Fires as a possible stop gap option. Best buy had several 32 GB Kindle Fires available for under $300. From what I’ve heard, the Kindle Fire has some of the best parental controls of any of the tablets. I talked to Jaeger about it but he was worried about being locked in to yet another vendor’s proprietary weirdness. His argument had merit so I checked and Best Buy also had some 7″ Nexuses. That seemed a reasonable option to get us through the Thanksgiving trip and then I could order a 16 GB refurbished iPad for myself later. After supper our whole family piled ourselves into Motoko to go visit the Genius bar. We got there, they checked us in, and settled in to wait our turn. They had a cute kids table with 4 tethered ipads on it loaded with kids games. I thought Calvin would be fascinated but instead he wanted to sit in my lap and listen to me read Alice’s Adventures in Wonderland. Eventually a tech came up, took a look at my iPad and proclaimed it dead, as expected. What was completely unexpected to me was he then offered to sell me a replacement 16 GB iPad 2 for $250. That was a better price than I’d seen online so I figured it was worth it to go ahead and order my replacement iPad now, even if it wouldn’t arrive in time. To my astonishment, he told us he’d be right back with it. I hadn’t realized he’d been talking about getting me a replacement immediately. That’s probably the best customer service I’ve ever had from an electronics manufacturer. Once the tech came back with the “new” iPad he poked a couple of buttons, we handed over our credit card, and then were on our way once again with a fully-fuctional iPad. Given we once more had a working tablet, I decided it did not make sense to follow our original plan and buy a Nexus for Calvin at Best Buy. So, we went home and I synced it and everything appeared to be back to normal. I was delighted that the experience turned out to be so cheap. However, I still had only a 16GB tablet. So, my purchase of the camera connection kit wasn’t going to be wasted after all. Following the Lifehacker directions, I created the DCIM folder and 100DICAM subfolder. Then I moved a test video file over and renamed it DCM_0001. It was a mp4 file which I had been led to believe should work fine. I plugged it into the iPad and was happy to see the iPad recognized the file and seemed quite happy to give me the option to import it. I imported it and then clicked on the Camera app to try to find it. Based on the instructions, I was let to believe it would appear in my camera roll. I didn’t see it. I tried several other things and tried to figure out where I went wrong. I tried different file extensions and still couldn’t find the videos. The iPad definitely thought it was transferring the files, it would ask me for confirmation when I requested it import something it thought it already had, but I couldn’t find them. Finally, I figured out my mistake (which you may have already noticed). I had been looking in the Camera app, not the Photo app. On my iPad I only use 2 of the 4 statically placed apps: Safari and Mail. As a result, I apparently have developed a blind spot in actually seeing the Photos and Music Apps. Now that I’m finally looking in the right app, everything is working perfectly. Of course, the biggest problem with this scheme is that all the videos are going to have really bizarre names: DCM_0001, DCM_0002, etc. I need to come up with some sort of index option that is relatively easy to use. That’s probably a project for tomorrow. This entry was posted in Calvin, Misc on November 16, 2013 by kiesa. When I became pregnant (5 years ago! ), I knew that I didn’t want to work full-time. However, I wasn’t sure if I wanted to work part-time or just quit. I decided to ask if I could start working from home and go down to 20 hrs/week. My manager is amazing and made this happen. Since then, I have been working 20 hrs/week from home and my employer has been very understanding about letting me work flexible hours. However, in 2014 we’re planning to migrate to a new ILS1 This is going to be a BIG DEAL. These last couple of years have been maintenance years so I haven’t been overwhelmed trying to get all essential tasks done during my official work hours. However, 20 hrs/week is not going to be enough time to navigate a migration. So, started in January, I’ll be increasing my work time to 32 hrs/week23. My tentative plan is to stop working Sunday mornings and instead work a straight Monday-Friday schedule. I’m hoping to get up at 6am and work a couple of hours before taking a break to drop Calvin off at PreK/daycare. Then continue working the rest of my hours before picking him up. Unfortunately, 6am is currently when I try to get up and exercise. Since Calvin has been born I’ve only been exercising sporadically. I’ll just have figured out how to exercise and something, usually Calvin’s routine, changes and I have to figure out where to gouge out time again4. It’s not a good idea for me to get no exercise because I like food way too much. I’ve been rolling this quandary in my head for several months now trying to figure out options. Gradually, I started wondering if a treadmill desk might be the answer. I’ve seen all sorts of articles about the benefits of standing desks and treadmill desks as well as a couple concerns. Up to this point, I’ve been a bit dubious. I’ve been fortunate in that at the moment I have no problems typing at a regular desk5. So, there hasn’t been a great need for me to investigate any variation of standing desks. As I said, the idea of a treadmill desk was rolling in the back of my head. Then, we got to the part in our ILS process where I needed to starting reading the manuals of our contenders. I love reading manuals, you find out such useful things. However, even I have trouble staying awake reading manuals for hours on end while sitting down. So, I loaded them on my ipad and started pacing down stairs in the living room. 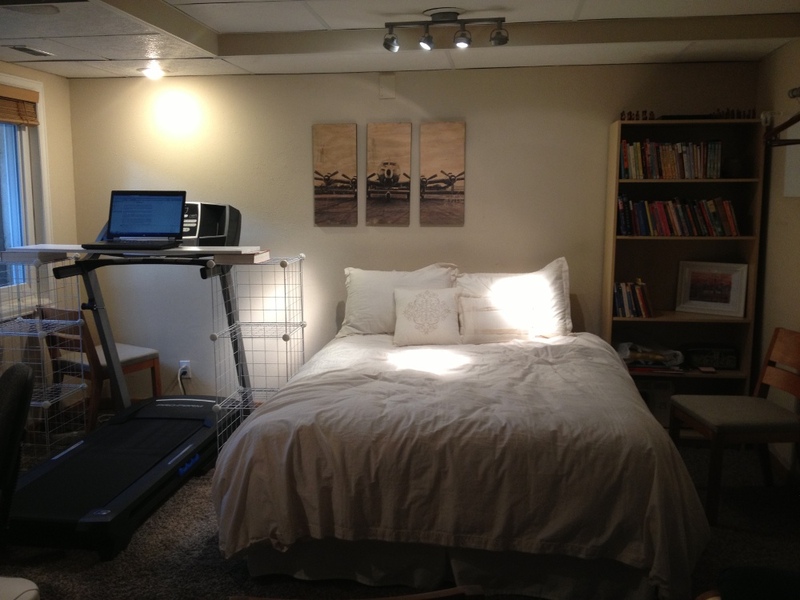 It mostly worked but also made me consider the idea of the treadmill desk more seriously. I know Craigslist always has someone listing a treadmill. I decided it would make sense to start looking for one now rather than in January when people, apocryphally anyway, decide to lose their December weight gain. I found several good candidates, one that was even only $25. However, the problem is we don’t have a car big enough to cart a treadmill home. So, eventually I decided to go and buy a cheap new treadmill. I found a ProForm 6.0 RT Treadmill on sale for $400 at Sports Authority. I bought it and was thankful to see that in the original box, it was able to fit in Motoko for me to cart home. Let’s be clear, this is a cheap treadmill. It’s a little bit on the quirky side but I bought it as a proof of concept. When I actually increase my hours and start making more money, I might end up upgrading. I put it down in the basement because we don’t have room anywhere else. I wanted it by the window for the natural light. In order to make it fit, I had to move the bed, one of the bookcases, and the loveseat sectional. The pictures, that use to be centered above the bed, are now off-kilter and I’m not sure if it would look strange to re-center them above the bed or not. So, I had the treadmill, but I still needed someway to use my laptop. I looked at several options. The cheapest option was SurfShelf. However, I’m not particularly tall and I was worried that it wouldn’t be adjustable enough for my needs. 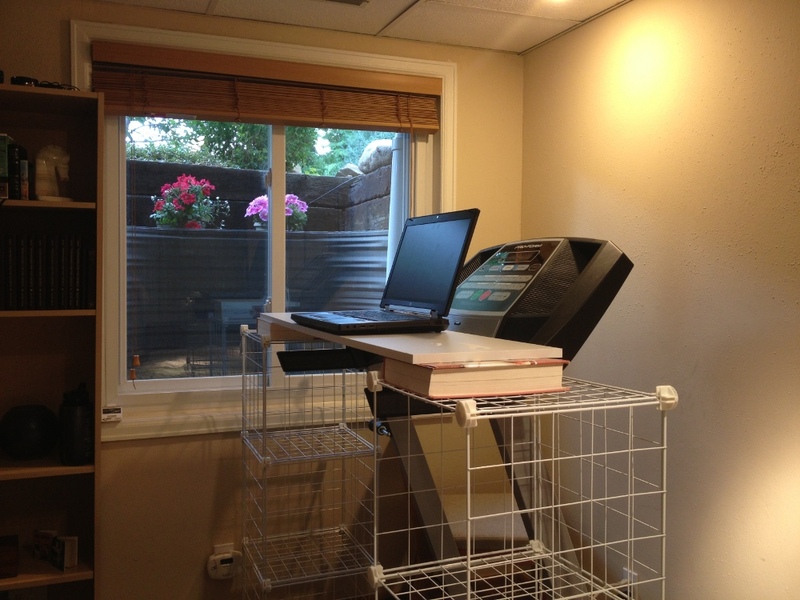 There are very nice looking treadmill desks or even fancier treadmill/desk combos but I was looking for a very cheap proof of concept option. I had no idea if I could work while walking and didn’t want to waste tons of money if it didn’t work out for me. So, this is what I ended up with. Yes, the picture lighting is very bad. I don’t have good options in the basement. 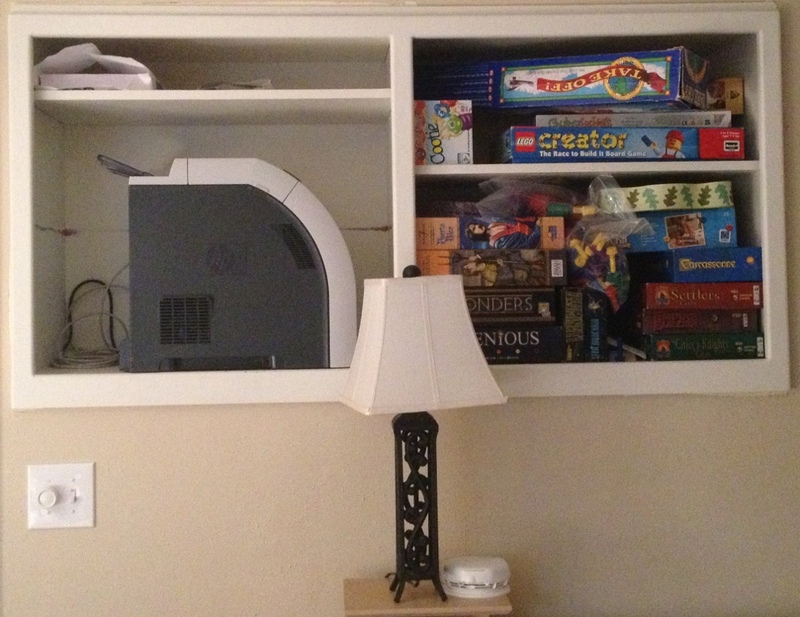 I bought a 48″ shelving board from Home Depot (under $10) and then used existing metal shelving that use to be in Calvin’s room. We had removed it from Calvin’s room because it was not sturdy enough to handle Calvin climbing on it. However, it seems relatively stable for the purposes of a prototype treadmill desk. Last Thursday I worked at my treadmill desk for a couple of hours and everything seemed fine. Friday, I got up at 6am and worked an hour and afterwards my left arm was aching. My first guess was I had the laptop set at the wrong height which was doing bad things to my left arm. Though, I found it a bit confusing it was only my left arm. I decided not to work on the treadmill any further until Jaeger could watch what I was doing and see if the angles were all wrong. On Sunday, Jaeger watched me typing and told me he thought the desk was too low, I nededed to raise it. After looking at a couple of free options around the house, I discovered the best height was achieved by sticking The King Arthur Flour Baker’s Companion on one end and the corresponding King Arthur Flour Whole Grain Baking on the other. Yes, it’s kludgy but it works for now. However, other than double checking the height was good, I didn’t work at the desk because I wanted to give my arm time to recover. Monday I went up to Greeley to pick up a printer for work. I had just been using our personal printer but given the amount of paperwork I’m going to have to go through for the ILS migration, I decided I should actually get a printer from work so I wasn’t wasting our personal toner. Calvin has no preschool for the entire week so I loaded up the iPad with storybook movies and carted him up to Greeley. Many of my co-workers at the district support building had seen Calvin when he was a newborn but not recently so they oohed and ahhed. Calvin was not excited by all this attention so I ended up carrying him in my left arm all around the building for about an hour. He was very grateful when I decided I had done enough socializing and left with a Laserjet 3600 DN in my car. Tuesday I got up at 6am with the hope of getting as much work as possible done before Calvin woke up. However, I had shooting pains in my arm the moment I started typing. I was bemused. My arm hadn’t been nearly this bad Friday morning and I hadn’t tried working while walking since then. Then, I realized the problem wasn’t the treadmill, it was carrying Calvin. Apparently carrying a 35+ lb child in one arm is a bad idea. I’ve been carrying him like this for the past 4 years so his weight just gradually increased and, until now, I haven’t had a huge problem with it. However, it’s probably time he learn to walk. So far, Calvin hasn’t been impressed with my refusal to carrying him various places, such as when we go in to the grocery store. My arm settled down by Tuesday afternoon and I was able to work about 3 hours while walking both today and yesterday. I’ve settled on a 2 mph walking pace. It’s pretty slow but I can do it without thinking. Plus, 2 mph/hr for 2-3 hours is still a reasonable amount of exercise, better than sitting anyway. 3 mph will probably be doable once I get more use to it and/or get a better desk. Jaeger has been wanting room in the upstairs study. Technically it’s “the study” but it kind of migrated to being “my study” because I used it significantly more than he did. However, he was getting annoyed at the amount of clutter I have which left him no room for his late-night India conference calls. So, I’ve decided to migrate my working desk downstairs completely. I’ve setup the little cubicle desk to be my workplace for the hours I don’t walk while working. I’m also hoping that having my sitting desk so close to the treadmill will make it easy to go back and forth. I also decided that if I was going to be next to the window well so much, I really should spiff it up a bit. So, it’s been weeded and new weed barrier and mulch have been put down. In addition, I splurged for some hanging baskets to add a little color. One day in and they haven’t died yet! What I have now is definitely kludgy. At a minimum, I’ll probably upgrade to a real desk once I start working 32 hrs/week. I probably will also want to do something about the screen. Right now I have to look down, instead of straight ahead, to type and that’s not the best position. I could probably mount/dock the laptop in front of the treadmill and then use a wireless mouse/keyboard at the desk itself. It’s a work in progress. This entry was posted in Misc on August 14, 2013 by kiesa. While Jaeger was gone with Calvin to NYC Anna, my kitchen computer, started rebooting randomly. The first couple times I thought it was coincidence. Then it started doing it multiple times per day. Given that Anna is located in the kitchen next to my mixer, I thought it was possible she was just clogged up with cat hair, flour, and grease. So once Jaeger returned he took her apart. There was definitely dust but it wasn’t anywhere near as bad as I expected. Unfortunately, that left the most likely problem as the hard drive. I did some testing and verified that the hard drive was beginning to fail. I briefly contemplated whether or not it made sense to just replace Anna. At this point, I think tablets are to the point where they’d meet most of my kitchen computer needs. Unfortunately, that’d leave me without a handy Windows computer to sync my iPod and iPad1. Weighing the pros and cons I decided it was probably best to just replace the hard drive and hope the rest of her lasts until we move overseas2. I decided fairly quickly that I wanted an SSD. I figured the fewer moving parts the better. After a couple weeks of lazy researching, I decided to get a Samsung 500 GB SSD. I ordered from Amazon because I currently have a trial prime membership3 and I could get it delivered in two business days. Jaeger left for San Diego Monday evening but handed over an external hard drive I could use to back up the important parts of Anna. Tuesday my shiny new SSD arrived. I was ready to have my computer back and already had everything taken apart by the time UPS showed up. Calvin was really excited because I didn’t want him anywhere near the disassembled computer so he got to watch TV. I knew it would be small but I didn’t visualize how small it would be. The SSD is on the bottom right, next to my iPhone. The original drive is in the upper left corner. I had also purchased a 3.5″ to 2.5″ converter bay and merrily set to screwing everything together. Then I realized I had a problem. Anna’s hard drive cable was just long enough to hook into the large older hard drive. The new drive, when screwed into it’s bay, was about an inch further away. The cable could not reach. I sat and stared at the cable and the hard drive and the converter bay. I reconfigured things multiple times knowing that it was no good but hoping I could come up with a kludge that would work. No luck. So, I started looking around for a physical store that would carry a 22 pin SATA power and data cable extension. Apparently they don’t exist. I was under this naive belief that just because I didn’t go out and buy hard drive cables at physical stores every day didn’t mean they weren’t available. I looked on all the local stores’ websites without success. Then I called Best Buy hoping it was one of those small items they just didn’t bother to list. The sales associate I talked to didn’t seem particularly well versed in cables. He kept writing down that I wanted a 22 inch cable, rather than a 22 pin cable. In the end, he confirmed they didn’t have it. The next store I called I kept it simple and asked if they carried hard drive cables. The answer was no. So, I went back to Amazon and ordered a 12″ extension cable. I was nervous that 12″ would be too much but there weren’t a lot of other options. It arrived on Thursday. Nowhere near as cocky as I had been Tuesday, I started trying to put things together again. 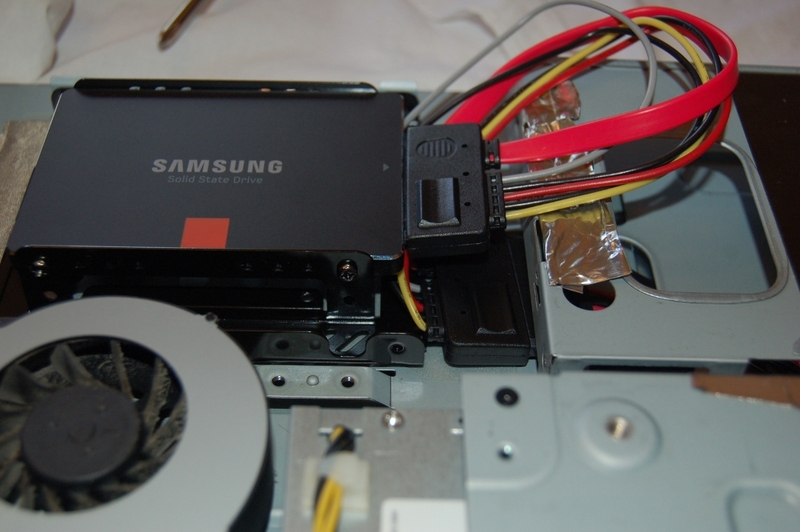 The converter bay I bought was made so you could put two SSDs in, if desired. Originally, I had put my SSD in the lower position. However, the two ends of the cable were too close together and I couldn’t make it fit. I changed the SSD to the upper position and tried again. It still didn’t really fit but it was close enough that I hoped it would work. In the picture above you can see how little room I had to work with. The original hard drive cable comes out underneath where the optical drive bay is and there’s no where except on top of the optical drive bay for the excess extension cable to go. It was a tight fit and I wasn’t entirely sure I’d be able to get the back cover on. Nor was I convinced the connections would be good enough it would all actually work. I’m not sure if you can tell from the picture but the cable is entering the SSD at a slight angle. When I originally decided to buy an all-in-one computer I hadn’t been thinking of scenarios like this . . . Anyway, I crammed everything in, crammed the back cover on and held it down while I screwed everything back together. To my surprise, and relief, the computer did turn on. Even better, the BIOS saw the drive and the Windows DVD seemed perfectly happy to install to it. I decided to do a clean install instead of trying to migrate my data directly. My old drive was only 320 GB so size wasn’t a problem but Anna had never had a clean Windows install. I had gotten rid of most of the gunk Windows computers ship with but she’d been three years with the same install and I figured it would be a good idea to start from scratch. Once I had the cover back on, everything else went really, really well. All her old programs appear to have transferred over fine and I think I’ve got all my files over also (though I keep thinking I must be missing something . . . ). She obviously is running a lot faster at the moment. She’s slow for an SSD, I think, but still much faster than she was4. Anyway, hopefully Anna stops being so dramatic and can now go back to being my convenient kitchen computer again. This entry was posted in Misc on July 26, 2013 by kiesa. After ignoring the back-end of my blog for way too long I finally decided to migrate off Serendipity. I installed Serendipity back in 2005 when there were many interesting choices for blogging platforms. However, I didn’t keep up with the updates and the comment spam was out of control. Long story short, I’m now on WordPress. At this point, I don’t have any URL redirection for links to old entries. I manually updated the ones within my own posts and I think the only other person who ever links to me is Jaeger. So, Jaeger may end up writing something for his own convenience. Anyway, I’m still not convinced WordPress is the best option but it’s working well enough now that I think I can ignore it for another couple of years. Now, if you want the longer story . . .
My initial plan was to migrate my blog to a hosted option where updates were nicely taken care of for me. I started researching blog hosting options and was surprised by the lack of options. I was leaning toward using Blogger since it would fit most of my needs. However, I was stumped over how to import my entries from Serendipity into Blogger. Serendipity provided me with a nice RSS feed of all my entries but there didn’t appear to be an obvious way to take those entries and import them into Blogger. I spent several hours poking and grumbling out loud at which point Jaeger started suggesting that I should try out wordpress.org 1. I was resistant because I really wanted a hosted option. However, after several more hours, I decided I didn’t care that much and was willing to give WordPress a try. At the very least, it’s such a popular platform that presumably there are many anti-spam widget options available. Jaeger started the famous 5-minute install which turned out to be more than 5 minutes but, all things considered, wasn’t too bad. Importing my entries was fairly trivial. Importing the comments was a lot trickier since there didn’t appear to be an easy tool to do that. Eventually, I dumped all my comments out of Serendipity, importanted them into gnumeric, ordered them by date and, using the date, attempted to match them up to the new IDs in WordPress. This worked reasonably well but wasn’t perfect since the dates seemed to be subtly different, even when adjusting for timezones. However, I only had a couple hundred entries so it wasn’t too painful to sanity check the date ordering. Once I got the IDs matched up, I figured out what columns were equivalent between Serendipity and WordPress and then put fake values in the new columns. Then I exported the data with a | as the field separator. My next task was to try to bulk import these values into the WordPress database. After some fumbling, I discovered that I had to be root to do this (why?). After some fiddling with the mysqlimport options, everything finally seemed to import into the database correctly. “Approving” the comments on the database side didn’t seem to make them show on the web side so I went through and bulk unapproved and then reapproved the comments through WordPress’ web interface. The last bit was figuring out what template to use and which widgets to install. I stuck with the default template. However, I felt the header image was a bit too large 2 and in an odd place so I made it smaller and moved it between the blog title and menu sections. This entry was posted in Misc on March 6, 2013 by kiesa. When Calvin was an infant, the daycare center we found didn’t offer part-time daycare for infants. So, even though I worked part-time, we paid for full-time daycare. Most of the time I’d pick him up after I finished work. However, since he was full-time, I basically was able to choose which set of hours during the day I wanted to work. Plus, if I was sick or for some reason got overloaded with work, I could keep him in for the full 8 hours. I got use to this flexibility. As most of you know, Calvin has always been an intense child that needs to know he’s the center of the universe. This makes it difficult to do anything useful when he’s around. As a result, I got in the habit of taking an extra hour after I stopped working to clean the house or do other essential things such as pay bills. Once he graduated from the infant room, I debated changing him to part-time care. However, the cost savings weren’t enough to off-set the work I wouldn’t get done while he was home. Plus, Calvin only takes naps at daycare now. He probably hasn’t taken a nap at home, unless he’s in the car, for more than 6 months now. Apparently, Jaeger stopped his naps at 2. However, it’s very obvious that Calvin still needs his nap. He’s an absolute terror when he doesn’t get one. I mentioned that I can’t do anything while Calvin is home, right? This includes supper preparation. I’ve tried all sorts of ways to get dinner on the table when Calvin is home but the only thing that actually works is letting him watch TV. We don’t have broadcast or cable tv so the only “tv” Calvin watches is from DVDs I’ve checked out from the library. I do like this method as it prevents him from seeing commercials and it’s easier to vet exactly what he’s watching. However, increasingly I noticed that he’d throw mini-tantrums when I turned off the TV. This worried me but I wasn’t sure what else to do. About a week ago I was listening to the Freakonomics podcast episode title The Upside of Quitting. In it, they discussed sunk costs. I’ve always been pretty good at not letting monetary sunk costs determine my future actions. However, I realized that daycare was a huge sunk cost that I wasn’t fully utilizing. I had been picking Calvin up between 2:30-3:00 everyday. However, if I kept him in an extra hour, I could use that time to pre-make supper. Then, once I picked him up, I could completely devote my full attention to Calvin without having to worry about doing anything else. It got even better. I took a look at the daycare schedule and realized that the extra hour Calvin was there is during outdoor play time. So, I’d be swapping him sitting on the couch watching TV for running around on the fantastic playground equipment that daycare has. This was the first week we’ve tried this schedule. However, it’s been a weird week in a couple of ways so I’m not sure this was a really good test. Monday, Calvin slept in till almost 9 (usually he gets up at 7:30) so I didn’t really have the extra hour I was planning. Tuesday is swimming lesson day and this is the one day we consistently get takeout. So, I used the extra hour to clean the house. Wednesday, Jaeger and I went to evaluate a potential prescohol for Calvin. The person I talked to said most parents take about an hour. I should have realized I would take longer. We took a full two hours. I probably spent more than an hour of that just asking the director questions. This meant that I was much later for work than I planned so I spent the extra hour working instead of fixing food. Today, Calvin slept in again, though not as much as Monday, so I was late to work again. Plus, Thursdays are the day that I go work at the library and that takes an hour in commuting time (30 min each way). So, I didn’t really have much extra time today either. Given that it’s past 9pm and Calvin’s still resisting sleeping, I suspect he’s going to sleep in tomorrow also. Even though this week hasn’t gone exactly as I envisioned it, I think this schedule is going to work out well for us. In general, it just gives me more flexibility in my day. I’m hoping that next week things will be calmer. This entry was posted in Calvin, Misc on October 14, 2011 by kiesa. Calvin is still pretty clingy. Fortunately, he isn’t crying as much when I drop him off at daycare. However, right at 5:30 for the last couple of nights he starts clinging to me and refuses to let go. It makes finishing supper prep and eating tricky. I haven’t been exercising as much as I should. Part of this is due to my sleep getting disrupted in various ways. First, Calvin vomited in the middle of the night last week and then fireworks started going off culminating on Monday night. The last couple of nights I have slept reasonably and so have been able to get up and exercise. On Sunday we went up to Rocky Mountain National Park and went hiking. Because of the crowds, we parked in Estes Park and took the shuttle bus to the main parking lot and then another one to our trail head. This ate up a fair amount of time. However, for Calvin this was the highlight of the experience. He did appear to enjoy hiking but he was really excited about the bus rides. I’m so glad libraries exist. It’s been miserably hot outside so instead of playing outside, Calvin and I have been visiting libraries. Longmont has a train set in the children’s room that Calvin particularly enjoys. I cleaned out my pants drawer and put all the pants that no longer fit or look ghastly in the thrift store box. This entry was posted in Calvin, Misc on July 7, 2011 by kiesa. It’s very hard for Jaeger and I to find a good equilibrium in caring for Calvin. I’m starting to get adjusted to the time change. Calvin did take a nap both yesterday and today though for a while I wasn’t sure he was going to. Finished reading An Unlikely Countess, by Jo Beverly, yesterday and The Lifecycle of Software Objects, by Ted Chiang, today. Very different books but both were good. I’m also currently listening to The Blessing of a Skinned Knee, by Wendy Mogel. I listened to it before I had Calvin but am re-listening to it now. I’ve been exercising consistently for several months now. I got called Friday night and asked if I could play piano for Cradle Roll as a sub yesterday. I said that I could try but I wasn’t sure how Calvin would deal with it. To my surprise, it mostly worked. Calvin did spend one song wrapped around my middle as I tried to play over him. Also, for a couple of songs he was a little too enthusiastic and banged on the top keys as I was playing a couple of songs. However, I think the other parents were amused more than anything else. Every time Calvin managed to sneak in a banging session on the piano another kid would come over and try their luck. It’s very interesting trying to play music while intermittently reaching out and preventing other hands from helping. This entry was posted in Books, Calvin, Misc on March 21, 2011 by kiesa. Several months ago Calvin lost my iPod Nano. I’m not sure how but it’s gone and he was the last person seen with it. I have a work iPhone that I’ve been using to listen to podcasts and library audio books. However, I really need to get my own. I’ve always been annoyed with how rigid Apple can be and as time goes by, I’ve been getting more and more annoyed. So, I decided to try replacing my iPod with something else. I mainly used my iPod for podcasts and audio books. The audio books are library subscriptions from Overdrive so they needed the ability to do WMA DRM. I don’t need a huge amount of space because I don’t keep the podcasts or audio books indefinitely so 4 -8 GB seemed like a reasonable choice. Plus, I prefer smaller players. After researching a bit, I decided either the Sandisk Sansa Clip or the Sony Walkman would fulfill my needs. I was leaning toward the Sansa Clip but wanted to touch it in person so Jaeger, Calvin, and I took a field trip to Best Buy. In person, the Sansa Clip screen looked too small. So I instead started comparing the Sansa Fuze+ with the Sony Walkman. I was pretty sure the Sansa was Overdrive compatible but wasn’t as sure about the Sony player so I went with that. I bought the Sansa Fuze+ but when I got it home, I saw that I had gotten the “+” version which had significantly worse reviews that just the plain Fuze. Most of the users seemed to complain about the touch interface which I had some concerns about in the store. I hadn’t opened the package yet so the user reviews convinced me to return it and get the Sony Walkman instead. Well, the Sony Walkman was a disaster. In many ways, I like it. I think the interface is reasonable and Overdrive transfers audio books to it beautifully. However, even though it’s supposedly Windows 7 compatible, I couldn’t get it to work right on my computer. I spent at least 6 hours trying to get it to work correctly. The only way I could get it to work was by telling Windows it was a USB drive. This kind of worked but it was cludgy and the (minimal) software that came with it didn’t recognize it as a valid device. Windows Media Player did but I discovered, to my surprise, that WMP does not have podcast capabilities. Eventually, I got it mostly working using Winamp. However, then I realized that the Walkman didn’t have bookmarking capabilities. That is, if I paused an audio book to listen to a podcast and then went back to the audio book, it’d make me start at the very beginning of what is usually a 60-90 min segment and I’d have to painfully fast forward until I reached the spot where I left off. I spent 12 hrs (8 of them asleep) convincing myself that I could live with this. However, by mid-day today, I had regained my sanity. To my surprise, but delight, Best Buy took back the Sony Walkman and didn’t even charge me a restocking fee in spite of the package obviously being opened. I’ve mostly resigned myself to getting another iPod Nano. I did look for other mp3 players that had bookmarking capabilities but the reviews were pretty lackluster. However, I’d really rather not get one of the new Nanos. My main complaints are 1) they’re too small and 2) I don’t like touch screens. My iPhone’s touchscreen I tolerate because work pays for it but it’s not my favorite way to interact with devices. So, I’m considering buying a used Nano instead. Still not sure . . . Seven Steps to Sold by Donna and Shannon Freeman – Nice general overview written in a friendly tone. Home Staging that Works by Starr C. Osborne – Discusses all aspects of how to make your house look it’s best to buyers. How to Sell a House Fast in a Slow Real Estate Market by William Bronchick – This book had more detailed steps than the Freeman book. It would probably be especially useful for “For Sale by Owner” info. He offers info such as it takes 100 people walking through your home to get 10 serious buyers to get 1 buyer in a position to make an offer (i.e. marketing is very important). He also provides tips for various aspects of marketing such as when taking pictures of the front of the house you want it to be at a 20 degree angle instead of straight-on. Today when I took Calvin to the park another child was filling my hands with bark chips and telling me it was “banana pie.” Calvin overheard this and picked some of the chips from my hand and pretended to eat them. I think this is the first time I’ve seen such abstract pretending from him. Normally, he will use our cell phones and pretend to talk on the phone or pretend to be driving a truck. However, the prop always is intended to represent what he doing. This entry was posted in Misc on March 2, 2011 by kiesa. After Calvin was born I started dreading long weekends. Calvin is very attached to schedules and having three days at home always seemed to disrupt life too much. However, I think this long weekend was fairly successful. Sabbath, I left the house around 9 and Calvin and I went to church. I had to go practice for music next week at someone else’s house at 4 that afternoon so instead of going home or to the Carbon Valley Library, I drove to the Westminster library. Per our normal routine, Calvin fell asleep on the way there (driving is one of the few ways to force him to nap) and I sat in the car a couple of hours reading waiting for him to wake up. Once he woke up, we went and played in the children’s section for a while before heading to our appointment. We didn’t get home till around 6:30. Fortunately, Jaeger was able to pick up pizza so we were able to eat as soon as we got home. Sunday I had the day off from work but we had the babysitter come over anyway. I think she’s working out very well. Calvin seems to like her a lot. I went down to the basement and spent most of the time scanning mementos from past years. I plan to scan most of the papers and then get rid of them. I never look at them anyway so they might as well just be in a digital form. Afterwards, I took Calvin for a walk in the stroller so he’d take a nap and when he woke up, we went grocery store shopping. Today we went on a short hike at Chautauqua. Calvin seemed in good spirits the whole time. Unfortunately, the last 5 minutes of the hike he tried to fall asleep. He had his eyes closed for a moment before I caught it and kept him awake. The only reason I did this is because we would have needed to transfer him to the car and it’s much better if we can get him to sleep in the car where we can just sit and wait for him to wake up. We went and had lunch at Tokyo Joes and Calvin impressed Jaeger by being able to eat with chopsticks better than me (which isn’t saying much but still seems pretty amazing for a toddler). We then made a brief stop by an Indian grocery store before heading home. Unfortunately, this is the point where we planned Calvin should nap and he didn’t oblige. While I think he would have been happier without a nap, he did seem to survive fairly well without one. Calvin slept very well until around 5:30 this morning. Unfortunately, I chose to go to bed late last night at 11 and so really could have used an extra hour of sleep. I’ve been finding all sorts of interesting books to read, mostly about home selling. I tend to get obsessive in my quest for information (a characteristic shared by my husband as evidenced by his “India Shelf.”). I started researching pregnancy 2 years before I planned (and did) get pregnant. Likewise, I’m now researching house selling as we’re thinking of moving in a little over a year. Several weeks ago I created a spreadsheet of house cleaning chores I needed to do and how often. I’ve been doing the routine stuff all along but I decided I needed to get more systematic to make sure I remembered to do the rarer types of things like dust off the fan blades, etc. At first, it felt like I kept adding more things to the schedule without being able to cross anything off but I’m slowly making it through my checklist. “Parent-Teacher conferences” for Calvin’s daycare were today. Since Jaeger had the day off he got to go to it also. The teacher went through the checklist of things that toddlers might be able to do and offered comments on Calvin’s daily routine. Basically she said he’s doing well and we don’t need to be worried about anything. The teacher said that it was obvious Calvin had an engineering mind. During one day, there were a couple of children clustered by the toy shelf. They wanted to get a xylophone that was behind two other toys. Calvin was the only one to think of pushing the other toys aside so he could reach back and get the toy (this is a complicated skill? It’s often hard for me to know what I should or shouldn’t expect a toddler to think of by himself). Also, when a seat he wanted to sit on was already taken, he built his own using some gymnastic mats they have. He also likes to do things his own way (&lt;sarcasm&gt;isn’t that a surprise?&lt;/sarcasm&gt;). The last time he was given playdough to play with, he decided to play with the playdough containers but stacking them up instead of the actual playdough. Calvin has started indicating when he needs to use the potty even when he has a diaper on. This is a fairly new skill. I think we’re going to try having him potty train at daycare again. As mentioned above, I went through about 1/2 a box of old cards, pictures, and other memories and scanned them in and then threw away the physical item. This entry was posted in Calvin, Misc on February 22, 2011 by kiesa. It’s been very sunny the past week. Today was downright spring-like with temperatures in the 60s. Calvin and I have been spending a lot of time in the park. Truthfully, dutifully wandering after Calvin in the park bores me. However, even though it can be boring, it is very relaxing and I think the sun is good for both of us. I cleaned inside and out of our front windows this afternoon. Yeah, it’s kind of funny to list window washing as an “up” but I feel such a sense of accomplishment when I get around to cleaning something really dirty. I started another J.D. Robb audio book, Portrait in Death. I really love listening to the progression in her characters and how their back stories evolve. I’m also listening to At Home: A Short History of Private Life by Bill Bryson. This books makes me very glad to live in this time period. It’s really amazing the recent advancements that we take for granted. Calvin is obsessed with buses and trucks. Anytime he’s in the car now he’s giving me a running commentary on the vehicles he sees. He often demands that I make the “yel oo us” (yellow school bus) come back to entertain him more. He also tends to say the phrase “yellow school bus” with long pauses between the words and then speeds it up at strange times so it sounds very much like an automated voice talking. More shredding. I also triaged my food storage shelf downstairs. This entry was posted in Misc on January 28, 2011 by kiesa.